The advantage of home made raw mango (kachhe aam) chutney is you can make it once and can eat it all throughout the year by storing in sterilized glass bottles. Peel off the kaccha aam and cut them into medium sized pieces. Heat water and sugar in a big vessel and bring it to boil. Now, put dried apricot, raisins, kaju, badaam, yellow colour and red chilly powder to it. SautÃ© it for 5 minutes. 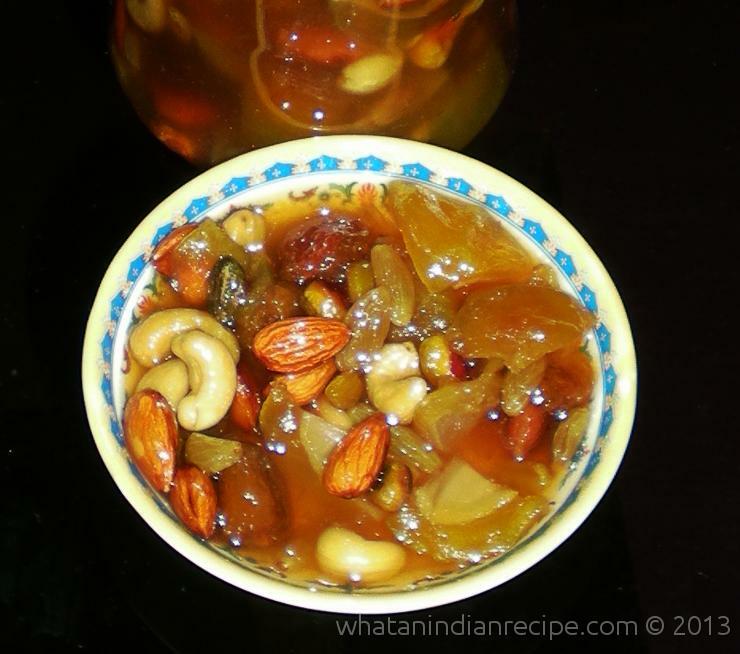 Add kacha aam(raw mangoes) into it and stir continuously till the liquid thickens and reaches a jam consistency. Remove from heat and allow it to cool in a room temperature. Serve this chutney as side dish with lunch or dinner or with rotis/paranthas.